What is a Baron or Baroness? Representing the King and Queen to the Barony when royalty are not present. It is Our duty to swear fealty to the King and Queen, support Their agenda, and uphold and enforce Kingdom laws within the Barony. We also carry information from the King and Queen to Cynnabar's populace and, in certain instances, present awards on behalf Their Royal Majesties. Representing the Barony to the King and Queen. 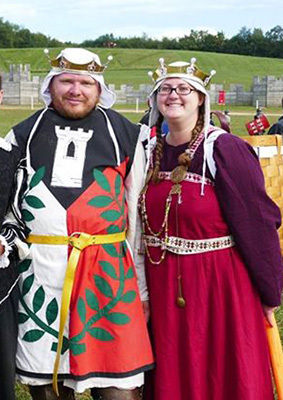 As representatives of the Barony, We travel to events around the Kingdom. We give regular reports to Their Majesties on the state of the Barony and communicate Baronial concerns and opinions to Them. It is Our responsibility to recommend members of Our populace to receive awards from the King and Queen, and it is Our privilege to host Them when They are within Cynnabar's borders. Supporting and leading the Barony. We work with Baronial officers and others in the Barony to recruit new members and address the concerns of the current populace. We support and attend Baronial events, meetings, and practices. We encourage and recognize good works and helpful acts within Our borders, and We appoint Champions to represent and lead the populace. Fulfilling ceremonial duties appropriate to Our rank. As Baron and Baroness, We bear the titles of Our rank and use the Baronial heraldry to identify Ourselves. Certain regalia, such as the ancestral Baronial coronets and thrones, are reserved for Our use. We have the privilege of establishing and presenting awards specific to Cynnabar. Please feel free to email us with any questions, issues or suggestions. Sheet music for "The Cynnabar Fight Song"
See the calendar below for events, meetings, and practices we plan to attend. Saving the Faith that I owe unto my conscience. So help me God and all his Saints. To the warriors of Cynnabar, we pledge that we will see to the proper training of a baronial militia. We will seek out and appoint men and women to lead you honorably in battle. Your oaths and obligations will be respected. Acts of chivalry will be rightfully recognized and rewarded. And if you fall on the field of battle, which must happen from time to time, you will know that you fought and sacrificed for a cause greater than any one person, and that your service through deeds of arms will long be retold in glorious song and story. To the scholars of Cynnabar, we pledge that we will build stages, workshops, and classrooms for you to display your skills. We will call forth accomplished men and women from Kingdoms throughout the Knowne World, inviting them to teach you and to learn from you in return. Your sacrifices on the altars of knowledge and expertise will be justly recognized and rewarded. With you and through you, we will make Cynnabar the most brilliant beacon in a far-flung sea of shining lights: a great theater, a boundless marketplace, a vast library that can never be burned down. To the servants of Cynnabar, we pledge that anyone who wishes to tread the noble path of Service has only to ask. We will see to your sustenance and replenishment as a solemn duty, and we will not deplete you of all you possess. The unmeasurable gifts you offer to us and to our people will be properly recognized and rewarded. And when you feel the bite of willing sacrifice, your pain will be eased by the confidence that you feel it in pursuance of a worthy aim. Ermenrich von Duisburg and Kasha Alekseeva became Baron and Baroness of Cynnabar on November 15, 2014. They are the Barony's fourth Baron and Baroness. Ermenrich is an accomplished court and tournament herald, as well as an avid student of other forms of theater and public speaking. He is also interested in 14th-century clothing and German history. He is a protege of Master Midair MacCormaic. Kasha is a musician and poet. Her other interests include Japanese history, medieval literature, and philosophy. Before swearing fealty to the Crown of the Middle Kingdom and being elevated to the Order of the Laurel, she was apprenticed to Mistress Conna ingen Ui Chearbhaill of the Barony of Three Rivers in the Kingdom of Calontir. For details about Kasha's food intolerances, please see this document.